We are a full-service, boutique style, internet marketing agency specializing in search engine marketing, web site design, social networking, display advertising and conversion rate optimization. To keep up with the fast-paced internet world we have created a blog to stay updated and share our thoughts. Google Testing New Sitelinks Format on Google Oficially Launches “Expanded” Sitelinks. While browsing the web during a presentation we noticed a new feature Google AdWords seems to be testing. 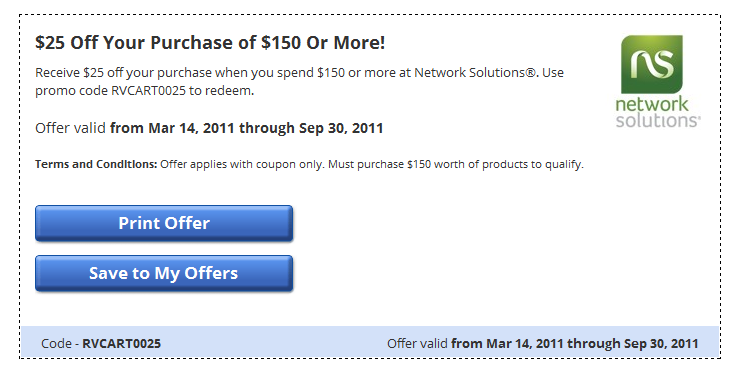 Beneath Network Solutions ad is an offer similar to a coupon. We began searching the web for information on how to enable these offers and found no information only a blog entry from LiftedWebsites here who seem to have discovered the same feature as far back as June 4th. Ironically their discovery was also in the domain registrar space. Screenshot of the AdWords Offer Coupon Displaying in Search Results. Upon Clicking the “View Offer” button you are redirected to this Google AdWords Offer Page. Has anyone else noticed these ads or had experience in enabling them in AdWords? © Copyright 2011 Search Marketing Group Inc.